January 10, 2018 -- Single-reading digital breast tomosynthesis (DBT) plus synthesized 2D mammography increased cancer detection and decreased recalls compared with double-reading standard mammography in a new study, published online by European Radiology on 2 January. In addition, standard mammography did not improve results when added to DBT. The researchers divided more than 16,000 women into four reading groups to determine which model performed best. The results warrant thinking about single reading of tomosynthesis plus synthesized 2D mammography as a new screening strategy, according to the team, led by Dr. Sara Romero Martín from the breast cancer unit at the diagnostic radiology department of Reina Sofia University Hospital in Córdoba, Spain. Architectural distortion in the left breast identified as invasive ductal carcinoma. 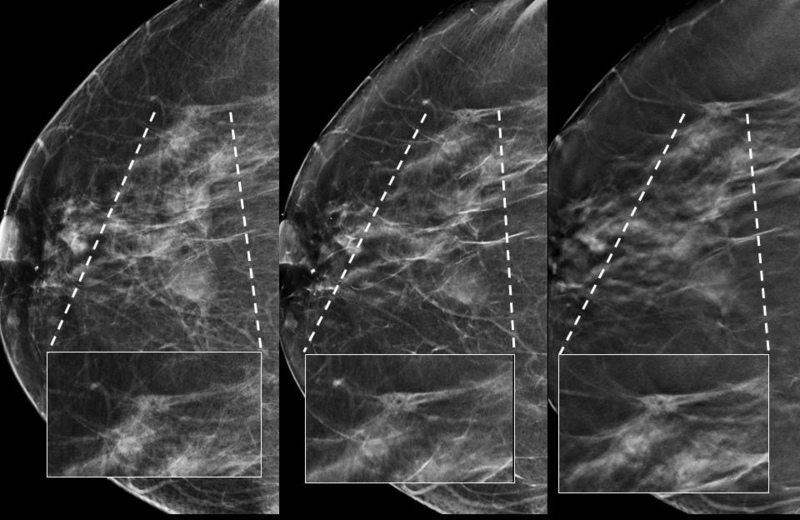 Left to right: 2D mammography image, synthesized image, and DBT image. All images courtesy of Dr. Sara Romero Martín. "Although initially we assumed that the difference between 2D mammography and tomosynthesis in terms of cancer detection rate would be greater than those obtained, we were surprised by the decrease in recall rate and the noninferiority of the synthesized image versus 2D mammography," Romero Martín told AuntMinnieEurope.com. "But the most relevant result was the superiority of the single reading of tomosynthesis plus synthesized, versus double reading of 2D mammography, with the important decrease in recall rate." Standard 2D mammography is the usual breast cancer screening technique, but experts continue to question whether DBT is up to the task as standard mammography has some limitations. DBT increases cancer detection and decreases recalls but amplifies radiation dose when added to 2D. Using synthesized 2D mammography -- or reconstructing a 2D mammogram using DBT data -- helps overcome the radiation dose, but DBT also has a higher cost and a longer interpretation time. Researchers have proposed changing the reading strategy by incorporating DBT because a single reading may not be inferior to a 2D double reading. The new strategy is effective and efficient due to the decrease in cost per reading and the cost associated with negative recalls, according to Romero Martín and colleagues. What happens in the real world though? That's precisely what they sought to find out. The researchers performed a population-based breast cancer screening study on 16,067 patients comparing DBT (Dimensions, Hologic) plus the synthesized images with digital 2D mammography in terms of cancer detection and recalls. 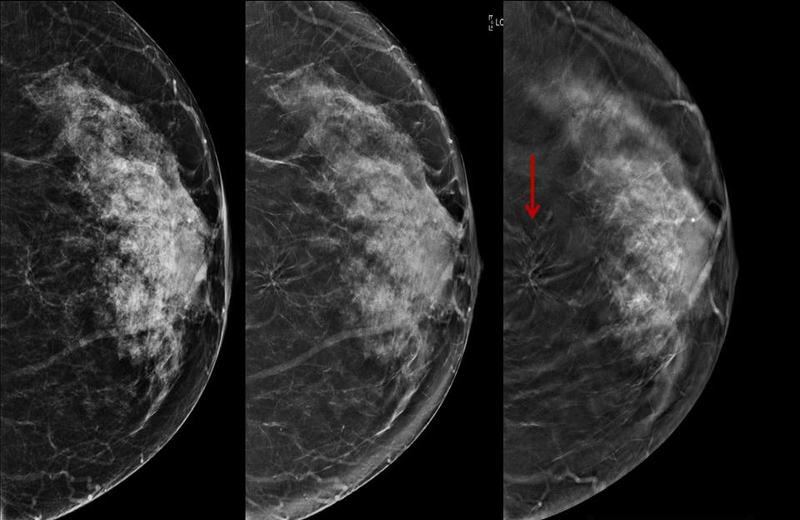 They also assessed whether synthesized images would avoid the necessity of 2D mammography and analyzed the value of single-reading DBT versus double reading 2D mammography. As part of the Córdoba Screening Program, women between 50 and 69 years old were invited to undergo routine biennial screening mammography. DBT was incorporated into the screening program in November 2014. Women who agreed to participate in the study underwent combined mammography plus DBT at the same time, receiving 2D mammography (mediolateral oblique and craniocaudal views of each breast) and DBT (also four views), with a single breast compression per view. The synthesized images were created from the stack of DBT images. The five radiologists in the study had been dedicated exclusively to breast imaging for three to 15 years. Each participant had four blind readings: two 2D mammography readings, a DBT plus synthesized reading, and a DBT plus synthesized plus 2D reading. No reader performed more than one reading per participant. The researchers analyzed paired double reading of 2D mammography with the DBT interventions. The team found 98 cancers and produced 1,196 recalls. The comparison of the techniques is summarized in the table below. The researchers also compared detected cancers and recalls between double 2D and single reading of DBT (third and fourth readings) to assess the single reading as a new screening strategy, and they compared double 2D and double reading of DBT to evaluate whether the availability of 2D mammography improved the outcomes of DBT. Regarding cancer detection, comparing double 2D with the third reading, the researchers found 69 cancers were detected at both 2D and the third reading. Seven cancers were detected only at double 2D compared with 18 detected only at the third reading, which resulted in an increase in cancer detection of 12.6% at the third reading. Comparing double 2D with the fourth reading, they found 65 cancers were detected with both techniques, 11 cancers were detected only at double 2D compared with 16 detected at the fourth reading, resulting in an increase in cancer detection of 6.2%. Comparing double 2D with double reading of tomosynthesis, the researchers found 70 cancers were detected with both techniques -- six cancers were detected only at double 2D compared with 22 cancers detected only at double reading of tomosynthesis, resulting in an increase in cancer detection of 17.4%. Spiculated nodule in the right breast identified as invasive ductal carcinoma. Left to right: 2D mammography image, synthesized image, and DBT image. Lastly, when comparing the fourth reading with the third reading, they found 76 cancers were detected at both readings. Five cancers were detected only at the fourth reading compared with 11 detected at the third reading, meaning an increase of 6.9%. The researchers observed no significant differences in cancer detection or recall rates between DBT plus synthesized and DBT plus synthesized plus 2D. Nor did they observe any improvement when 2D mammography was added to DBT plus synthesized, which could avoid the performance of 2D. "With these outcomes, we think that a single reading of tomosynthesis plus synthesized mammography can be proposed as an alternative to double reading of 2D mammography," the study authors wrote. In terms of future research, Romero Martín and colleagues are studying the interval cancers in the population studied and the influence that computer-aided diagnosis can have on single reading.